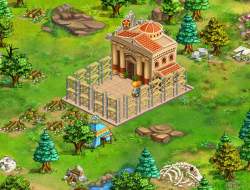 The gods are all on your side in this amazing strategy game. They need a man on earth they can trust and all the power will be yours if you follow their guidance. Learn how to create an empire and then try to conquer as much land as possible. Jupiter will show you how and what to build and what each unit does. Try to follow his advice closely and you will surely become a great and good king on many of the worlds realms. Your story has just begun and the ending should be glorious if you prove to be a good leader. Use the mouse to interact with the units and menus. All My Gods 10.00 between 0 and 10 based on 1 votes.